Memorial Day, a day for parades and picnics to remember and honor many. 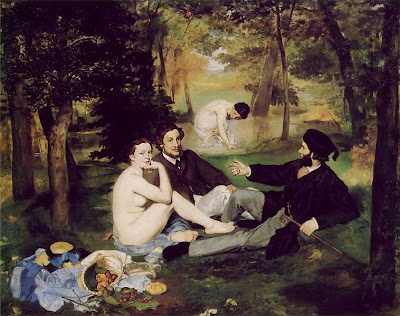 One of my favorite paintings "The Picnic" painted by Manet. May your Memorial Day be pleasant and one to remember. How will you remember those who served, with a parade or a picnic? I will remember going to the special parade and then we would always go to the beach for the day-ending with dinner out. Always being thankful to those that serve and give. What will you be doing on this day of remembrance? Really miss celebrating! Just gonna send my prayers out to the service people fighting for our freedom. And look forward to the day I'm back in America to celebrate in person. Enjoy! Our holiday was last weekend for the Queen's birthday. We never see her here in Canada but it does give us a day off! 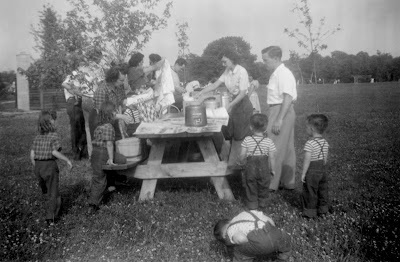 Was just working on a picnic post theme when your post came up.....we must all be in the mood for dining outdoors. Lovely day so off for a long bike ride, though my legs are a bit sore from last week's overly-ambitious mileage. Enjoy the day. Patricia, I am taking a day of rest , maybe some painting, and thinking of my late husband. He was truly a wonderful man. We hung our flag this morning, and went to the local town parade. I always get teary eyed when I see the older soliders still standing straight with honor and pride. We are headed to the neighborhood cookout by the pool! I LOVE that old photograph! Those little boys with their backs to the camera look adorable! We will have our older boy over for a barbeque with his mom & dad and little brother. Spending the day with my family by my side gives me many things to be thankful for. I will remember my sweet father who served his country many, many years ago who I lost 12 years ago. I miss him. I'm just back from the town parade. So nice. A beautiful day. My Dad is the Historian of our local Amer Legion Hall-with a parade, of course! We are grilling and swimming and pausing to be grateful. With little children splashing in a baby pool. And then a lot of screaming when we make them come inside. And a happy hour that starts at 3 p.m.
Maybe we'll brave a real picnic next year. Watching the National Memorial Day concert on PBS...and a poolside picnic of turkey sandwiches and Virginia strawberries. Hope yours was happy and relaxing!